If you have Chrome Autofill activated, over time you may end up with many, many entries. You even may have entries that are no longer accurate or valid. For example, you allowed Chrome to save your home address for filling out forms, and you move. This post will show you how to remove the old entry, or just update existing entries. 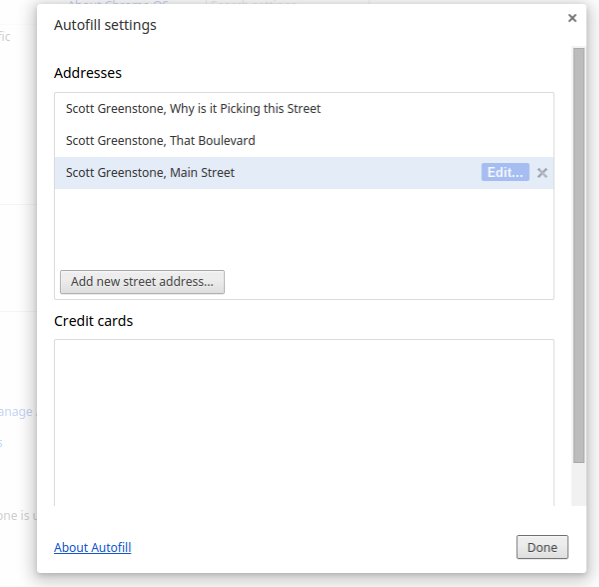 In order to manage the autofill entries, you need to navigate to the Autofill Settings inside the Chrome settings. You can either go into the Chrome settings by clicking the three horizontal lines in the top right of the browser and click settings towards the bottom, or you can simple enter chrome://settings into a new Chrome tab. Once in the Settings menu, scroll to the bottom and click Show advanced settings... at the bottom. Scroll down until you see the section Passowords and forms and select Manage Autofill settings. Once in the Autofill settings you will see a list of all the items you have for addresses and credit cards. To remove an entry, just hover over that entry and click on the X that appears on the right hand side. To modify an entry, hover over it and click on the word Edit. 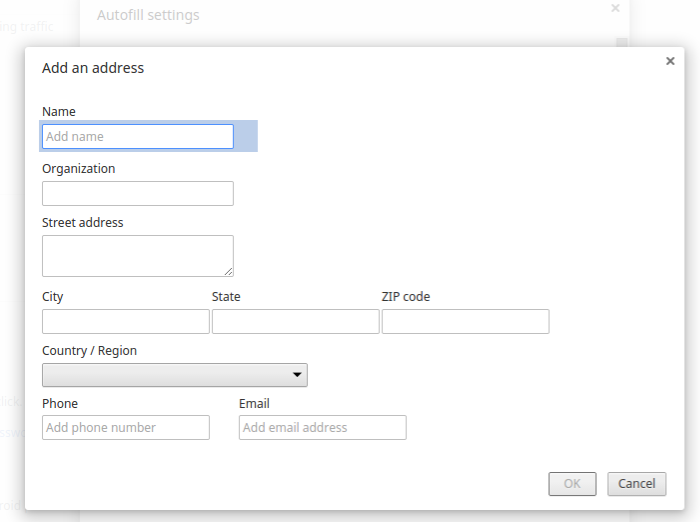 To add a new address entry, click on Add new street address and fill in the fields you want to use. Pretty simple and straightforward. Please remember to circle me at +Scott Greenstone and follow me on Twitter @sgreenstonenj. If you have any requests for posts, please let me know. I just have a Google login for gmail, not Chrome (Firefox). Suddenly, every time I go to login somewhere, it autocompletes my login name. I don't want to do that. I can't find the "settings" option anywhere in my regular Google account. I would appreciate some help in disabling the autocomplete. Thanks.